How We Started Our Cleaning Business is our personal story of the business we started in 1997. Our advice on How to start your own cleaning business. Are you considering starting your own business? You have some genuine concerns and some questions, no doubt. Seeking other people’s success or failure stories is a good idea. 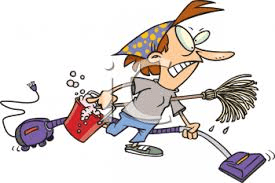 My husband and I began our cleaning business almost 18 years ago. This is our story. Why would you start your own business? We were newlyweds. Stacy was working at an air conditioner factory, on first shift at the time. I was a manager of a local restaurant chain, with about 4 restaurants to their credit. We both had dreams of going to college and creating a better financial future for ourselves. Along that pathway, we knew we needed to increase our income and have better control over our financial future. My baby girl was 10 so we knew we had to consider her future as well. In a nutshell, our reasons for starting our own cleaning business were simply to increase our income, and take better control of our financial future. Of course, achievement of those goals is based completely on the success or failure of our business. Because we knew we could give great customer service which would help our business grow. My husband and I are great communicators. We can talk about one subject for hours on end, discussing every possible scenario. That is precisely what we did while trying to decide to begin a cleaning business.We chose the cleaning business because we felt capable of giving quality customer service. We also had confidence in our ability to grow the business into a profitable venture. We felt that we had the skills needed to achieve our goals. Because we had a great work ethic. My father was a business owner most of my life. He instilled an excellent work ethic in all of us. I had already used those great work ethics as a restaurant manager, providing great customer service and managing others as well as the profit margin successfully. Because the start up cost were minimal. The start-up cost was very minimal as well. We discussed other possible business ventures but ultimately felt the cleaning business would be best suitable for us. We chose the cleaning business because we felt capable of giving quality customer service. In 1997, we did not own a computer nor a cell phone. I went to the library to do some research on starting a cleaning business. Information sharing is valuable! I armed myself with lots of books and began to read their success and failure stories. It is a great thing to reach a point in your life where you can learn from other people’s failures! Embrace that opportunity. There are many, many books out there with instructions on how to clean. A word of warning here, One person’s idea of clean and another person’s idea of clean are NOT the same! You will need to educate yourself on proper cleaning techniques for a professional. You do not want to walk into your very fist job completely unprepared and realize your mistake after you get on the job. You only have one chance for a First Impression, make it a good one! It is a great thing to reach a point in your life where you can learn from other people’s failures! Embrace that opportunity. You should always pray about decisions. Proverbs 3: 5-6 Trust in the Lord with all thine heart; and lean not unto thine own understanding. v6 In all thy ways acknowledge him, and he shall direct thy paths. We based our pricing on local trends. You cannot charge more than the job is worth. Remember that you can always lower your price more easily than raising your price. We started out by charging a per room rate which was $7 in 1997. We quickly learned that folks would ask us to come and only clean a few rooms so we dropped that philosophy quickly. We settled on a base rate fee plus a reasonable amount for items we deemed extra. You can start the very best business ever created but if you don’t have any customers, you will not profit one penny. Marketing is essential. As previously mentioned, when we began our business in 1997, we did not have the internet nor a computer and not even a cell phone. Can you even imagine that now? Facebook was still 7 years away when we began! Back then, people still took out ads in the local newspaper. We couldn’t afford an ad in the newspaper just yet. We created a nice typed flyer. We had our flyers printed at a local office supply store. We did the footwork to gain customers by driving around in target neighborhoods and placing the flyers in newspaper boxes. We saw that a local, up and coming, electrical company was placing magnets onto the outside of mailboxes. We thought that was clever! Our efforts did pay off, we got a few customers with our flyers! It was a good start for us. We eventually graduated to placing ads in the local newspaper on a regular basis. We joined the growing ranks of cell phone owners as our business began to grow. Having a cell phone number to share made us available to potential clients at any time. We also advertised with ValPak coupons. Back then, Valpak coupons arrived in the mail with specific coupons targeted according to zip codes. I remember sitting down with the Valpak representative in his office. We had named our business Pig Sty-le Cleaning. Have you ever referred to your home as a Pig Sty when it got particularly dirty and you were aggravated? That is where we got the name from. Well, that Representative from Valpak didn’t like our business name and tried to get us to change it. I refused. He predicted our failure would not be far off and it would be completely related to the fact that no one would like the name of our business. We thanked him for his opinion and placed the ad with him anyway. The rest is history as they say. We never needed to place an ad with Valpak again because the results were overwhelming the first time. We still had customers from that Valpak ad campaign, 16 years later! He was wrong about our name. It has never hurt us in any way. We got lots of calls because of our name because people really do believe their home is very dirty sometimes. Remember, One person’s idea of clean and another person’s idea of clean are not the same. Word of mouth is the very best advertising there is. Your clients will refer you to their friends and neighbors if you are giving them great customer service . We got to a point where we just had to turn down new client referrals because there are just so many hours in a day. At one point we were running three crews. We started our business in late August of 1997. Our very first client was a business whose office we cleaned. A friend worked there and hooked us up with that job. We cleaned there at night, twice per week. We originally worked only on Friday’s and Saturday’s. My husband was working 4/10’s. (4 days per week, 10 hrs. per day) He was off on Friday so we planned to work the cleaning business on Friday. I left my full time position as manager at the restaurant and worked part time for a while at J.C. Penny while growing the cleaning business. We didn’t start all of the advertising until early 1998. We used that time to make ourselves more knowledgeable about what people expect from a professional cleaning. Our business quickly grew once we started advertising. We reached a point where we needed help. We had lots of new clients and were scheduling so many jobs, we had to have help. In the early years, my oldest daughter helped us. Then we went through the normal gamut of relatives working for us. I was very protective of my clients. When someone extends the kind of trust required to hire you to work inside of their most private space, their home, that trust requires great respect. I knew there were plenty of untrustworthy folks out there seeking the opportunity to work INSIDE someone’s home. I came in contact with a couple of those folks. Bonding insurance is very expensive. Losing your reputation is even more expensive. Now, you can do background checks online yourself. If you grow your business to the point of hiring, pay the fee for a good background service! I once hired a ‘nice’ lady to help us. She talked a good game. I took her with me on my crew that day so I could keep an eye on her and make sure she was safe for us to employ. This was my first experience hiring someone who was not a relative. I took her to the home of one of my favorite clients. It was a 3 story, sprawling house filled with expensive antiques and collectibles. This client also owned a local business which we cleaned as well. They were important clients to me. I kept this new hire in the same room with me at all times. Before we could even get started good with the cleaning, she began to shake. Soon after the shaking began, she broke out in a sweat and turned red. It was very obvious that she was experiencing withdrawals, she needed a ‘fix’ of her drug of choice. I escorted her out to my vehicle and told her just to wait until we got done cleaning and I would take her back to her vehicle. I paced to the window often to check on her. I took her back to her vehicle, paid her anyway and fired her. I learned my lesson. I had hired her because we desperately needed help and she talked a good game on our phone interview. We purposefully decreased our cleaning business when we were nearing the end of our college careers. Yes, we both worked full time AND went to college at the same time. My husband worked two jobs because he continued to clean with me on the weekends and worked his job at the air conditioner factory while going to college. He graduated with honors. It was rough, not gonna lie about that but worth it. The goal was to pursue a less labor intensive career for both of us by achieving college degrees. My husband graduated from college in 2005 and began a great career in the Human Resources field. I graduated from college the same year our baby girl did, 2009. She was only 10 when we started our business. At one point all three of us were in college at the same time. Both of our daughters also worked with us cleaning houses. We cut back on the number of clients we kept as we neared the end of our college careers. My oldest daughter started her own cleaning business and adopted our clients. They knew her well as she had been working with us for years and had been in their homes for all those years. It is really hard to walk away from people who have become an important part of your life. You get to know folks when you provide such a personal service. I have rejoiced with my clients as they were blessed in their lives, cried with them during sad times, attended funerals of clients we loved and even now visit one sweet gentleman in his mid 90’s who is now in assisted living. While we preferred residential, we also did commercial cleaning as well. Our cleaning business did help us to achieve our original goals including paying off debt, buying a home and going to college. It also provided us with an opportunity to make great friends and develop our people skills. Ask yourself Why do I want to start my own business? Are you qualified? What do you really know about the professional cleaning business in particular? How much start up money do you have? How much will it cost you to start your business? What kind of marketing can you afford. Social media plays a giant size role in marketing these days. Are you knowledgeable about social media marketing? Can you afford to hire a social media marketing expert? How big do I really want my business to grow? Can you recommend me any book how to clean house?? What was your favorite book you have read, you liked the most? These things take time. Keep at it until you have a good client base. Your clients will give you referrals. Way to stick to your guns about the name of your business and not changing it because someone else, who did not go through the blood, sweat and tears of starting a business, thought you should! Great points on starting a business. Everyone thinking about starting their own business should read this! This is great, Shirley! I always love a good business story 🙂 I wish you lived closer! I’ve only had two people clean our home other than me, and I wasn’t thrilled with either. Some weeks it sure would be helpful to have someone I can trust to come and take that load off! I am absolutely positive that I would make a terrible client for a cleaning service because I would expect way too much. For a couple such as you and your husband, you could have your home professionally cleaned about once every 2 weeks and that would be fine. Now, if you could only find the right service provider! I’m so happy to hear there are other married couples out there who actually enjoy working together. Apparently that is not really the norm! There sure is a learning curve in business but it is valuable experience for life in general. Ahhhhh Shirley, looks like you and hubby did well with the business. I cannot believe was $7 per room in 1997. That was only a few years ago. And today, I sure prices are sky high. Thanks for the great tips. It is always great to see how people take control of their finances. There isn’t a giant difference in pricing through the years. If the economy had not crashed in 2008, it may be hugely different, but not so much in our neck of the woods. Great advice here! I do think sometimes about starting a business, but there always is something in a list, that I do not thing to be capable for. To read your experience helps to be realistic, but it the same time know that it is doable. Anna, I love the little phrase, “If it is to be, it is up to me” I’m sure you can do it. That is awesome advice. I think it will really bless others looking to start their own cleaning business. When I finally get around to a post on making extra money as a Momtrepreneur, I am going to reference this article. I love you Amanda! Momtrepreneur, I haven’t heard that term but I think I love it too! I’m sure there is a local service there who would be happy to help you but you can do the work yourself if you don’t try to do it all at once. Spread it out over several weeks, that makes it easier. I have started my spring cleaning here. Great advice to those wishing to venture into the business field. 🙂 Thanks for sharing your experiences and expertise. 🙂 Have a great day! Thanks for stopping by Becka. I enjoyed writing about our experience, fond memories. I can’t believe so many years have passed by. This all looks like great advice! You should know, since you’ve been through the entire process. It’s amazing how you think you’re prepared and when you get into it, you learn many new things. Your advice at this stage should save people some time and issues down the road. Thanks for the informative post! Learning from experience is the best part, isn’t it! Well, maybe not at the time but looking back, it is 🙂 I hope someone will find this information helpful.